Dennis Miller and Christina Applegate have "Up" arrows of late. 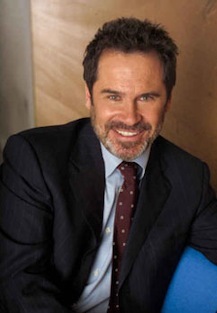 Dennis Miller has landed both his old Monday Night Football booth mate and another prime-time game show. The acerbic comedian/commentator, whose opinions have tilted well to the right in recent years, will have fellow conservatives Al Michaels and Red Sox pitcher Curt Schilling as guests on the first edition of Sports Unfiltered with Dennis Miller. The weekly one-hour program premieres Tuesday, Nov. 6th at 9 p.m. (central) on the Versus cable network. "I'll call 'em as I see 'em," says Miller. NBC also announced Thursday that Miller has been named to host the new "comedy quiz show" Amne$ia. It's from reality maestro Mark Burnett (Survivor, Are You Smarter Than a 5th Grader? ), and is seen as another effort by the broadcast networks to protect themselves with unscripted reality programming in the event of a writers' strike. "I immediately realized it's a comedy first that just happens to be wrapped in a game show package," says Miller. "And that allows me to be who I am." ***ABC has ordered a full season of its new comedy Samantha Who?, starring Christina Applegate as -- an amnesiac. It's the third ABC newcomer to get a pickup, following Private Practice and Pushing Daisies. ***Dallas native and former Prison Break co-star Lane Garrison has been sentenced to 40 months in prison after pleading guilty to vehicular manslaughter without gross negligence, driving under the influence of alcohol and furnishing alcohol to a minor. He was the driver in a December accident in California that killed a 17-year-old passenger. Garrison, 27, played con artist David "Tweener" Apolskis, whose character was killed off early last season.